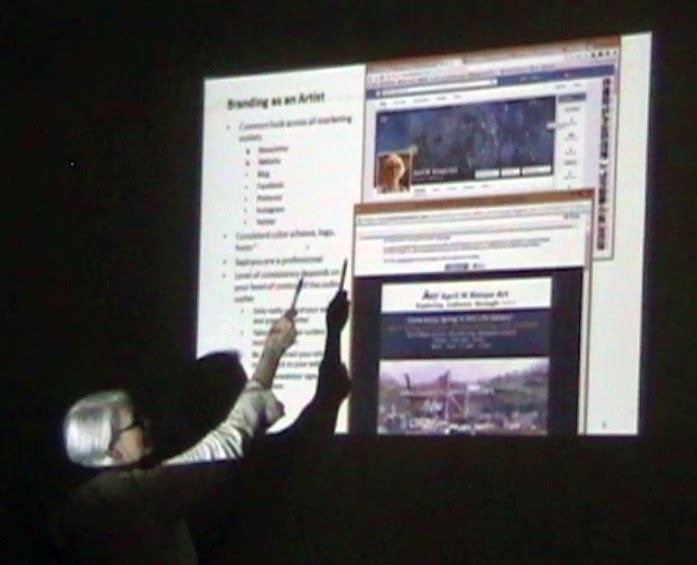 Earlier this month I was invited to speak to the Ellicott City Arts Coalition on Email Marketing. I've spent much of the last few years learning about this subject through research, practice, and testing what works and what doesn't work. I have heard too many webinars or attended classes that spoke in such generalities it was difficult to get a grasp of what to do, so I included examples to help bring reality to the information. 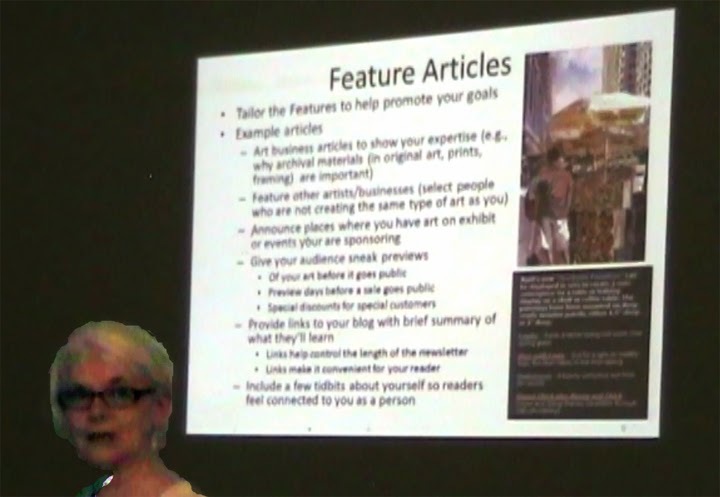 This group is composed primarily of small business owners, so we didn't spend time discussing how their goals affect the content of their newsletter, but knowing your goals and having a plan for achieving these goals is an important element to determine what to include in your newsletter and what not to include. If a subject won't help your goals, then don't waste your time including it. Also consider your target audience: is it customers who have purchased from you, prospective customers, friends, gallery owners, the press? Be sure to focus on what your audience needs, not sales. Some say not more than 20% of your content should be sales oriented or you risk losing your readers. Pay attention to your open rate (the percentage of those who receive the newsletter open it) and click rate (the percentage of those who open the newsletter follow a link in the newsletter.) Obviously getting the newsletter opened and not deleted is the first goal. Since your readers must opt in they likely open the first few newsletter they receive, but do you retain them as readers? The average open rate for the arts and crafts industry is about 25%. I have managed to achieve 40 - 45%, but I pay a lot of attention to who opens the newsletter and what links do they click. When I see the open rate begin to decrease I evaluate what people are exploring further (i.e., which links do they follow) and which aren't of interest. As long as you pay attention and tailor your content to the audience, you will do well. If you feel you don't know what to talk about, there are lists available on a variety of blogs that provide suggestions. Tip: I've found that when things occur I immediately place them in my next newsletter as a reminder. A few days before publishing the newsletter I review the content removing what seems of lesser importance and refining what I decide to keep. My husband serves as my proof reader. His critique has improved my writing style so there are now fewer and fewer edits necessary. If you don't have a family member who can proof your writing, find someone. Thoughts from someone else can only help. And don't worry you can unsubscribe at any time if you decide its not for you. 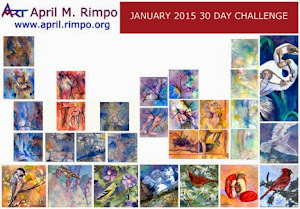 It's interesting how the personality of a painting evolves from start to finish. When I finished the design I was thinking all about light and shadow and how I could really use this painting to show the influence of light on its surroundings. I started with a violet and yellow orange wash over the surface of most of the painting to separate the two sides. I liked how the figure on the right would be partially shaded and the other would be more subdued. I stuck to that part of the plan, but as I gradually worked through layers of the painting I let the result of the previous layer influence what I did next. In between working on this painting I worked on a couple other paintings that were much more abstracted figures where the shapes were what was important and not the details, so the dichotomy of working a little on this and a little on those no doubt also influenced how this painting proceeded. 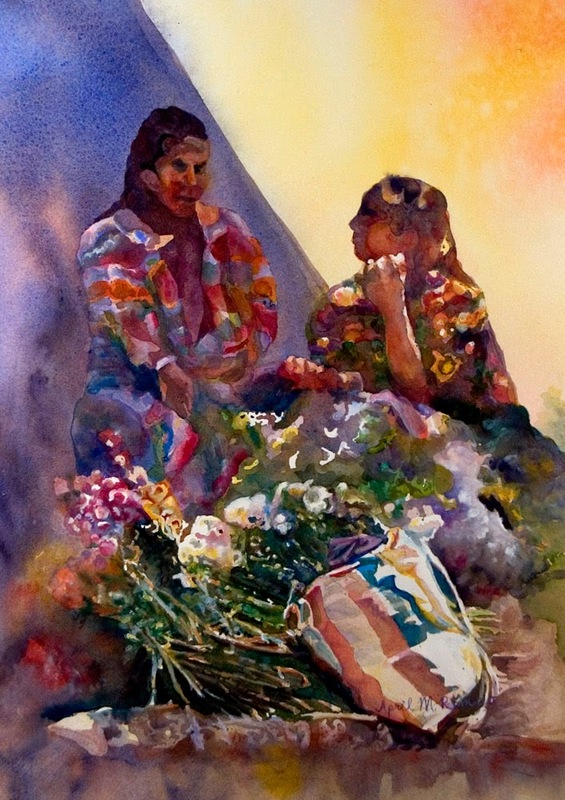 As time passed I decided it was the interaction between these figures "conversation" that was important; I wanted the gesture of their postures to communicate their intimacy and that the details would shift more to the flowers and their surrounding. My goal was to portray the beauty of this friendship through a lovely setting that captures their warmth. By the time I finished I wanted to know more about them and wondered what they are talking about. How did this painting make you feel? Last weekend my husband and I went to see the movie Woman in Gold named after Gustav Klimt's painting of Adele Bloch-Bauer painted in 1907. The movie follows the the legal and personal struggles of Adele Bloch-Bauer's niece, Maria Altmann, and a young lawyer, Randol Schoenberg, who was the son of a friend in their attempt for restitution of several seized Klimt paintings, including The Woman in Gold (Adele Bloch-Bauer I). Interspersed with the long legal battles from 2000 through 2006 are flash backs to Klimt painting the portrait of Maria's Aunt Adele, life in Vienna just before the Germans arrived, through the time when Maria fled from Germany with her husband. In the movie Helen Mirren plays Maria and Ryan Reynolds plays her lawyer, E. Randol Schoenberg. I must say I loved the movie. In part because I learned more of the story of the painting, but also because of the emotional investment of both Maria Altman and Randol Schoenberg. They took turns convincing each other to continue their battle as their passion and feelings of frustration regarding the reality of restitution rose and fell. When one was ready the give up the other kept the fight going. The interplay between Maria Altmann and Randol Schoenberg was as gripping as the painting is beautiful. 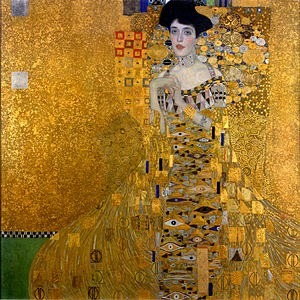 Now the painting The Woman in Gold is located at Neue Galerie New York, Museum for German and Austrian Art, which is holding an exhibition titled "Gustav Klimt and Adele Bloch-Bauer: The Woman in Gold. The exhibition is opening in conjunction with the movie and running through September 7, 2015. To learn more about the painting and the exhibition click on the link provided. I was so surprised when I saw children in Guatemala playing Ring Around a Rosie. I knew the games origins are supposed to be from Europe and the Europeans certainly traveled to Central American at the same time they traveled to North America, but none the less my reaction was surprise, followed by a big grin. There is something so amusing about children. Some are so focused on the game they look toward the leader (off page of the painting) attentively, while others stare at their feet, likely watching a passing bug, and some chatted with their best friend totally ignoring any instructions they may have been given. I watched the organizers of the game attempting to get the game started for at least five minutes. It was a very large group of about two dozen children. By the time I refocused on the painting demo that was going on by our workshop instructor he had made lots of progress, but the game was still at a standstill. These little moments of everyday life speak to me whether here in the United States or when traveling abroad. This is why I call my art Exploring Cultures through Color. I somehow feel compelled to share these little moments with you. 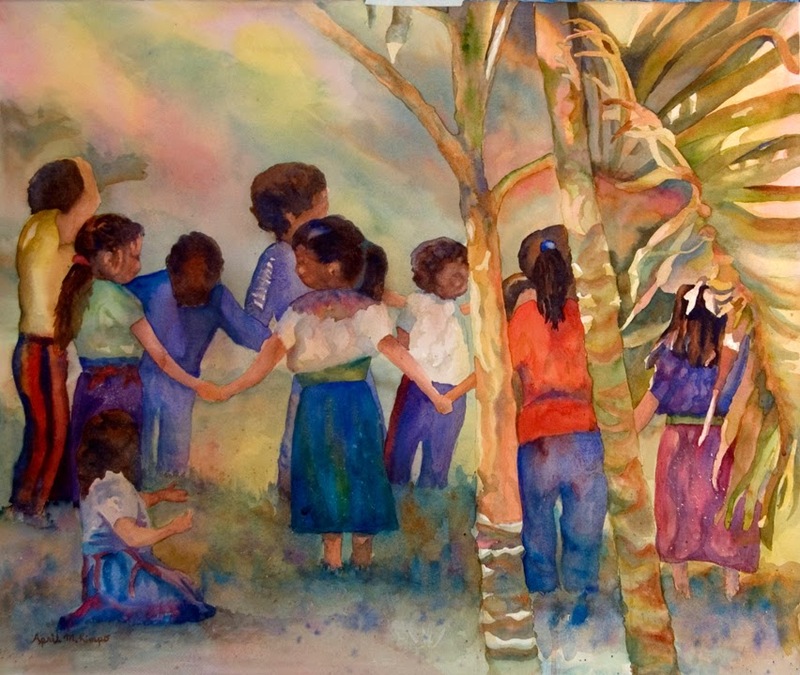 Another of my paintings with children at play is Day at the Fountain, inspired by a trip to Charleston, South Carolina. 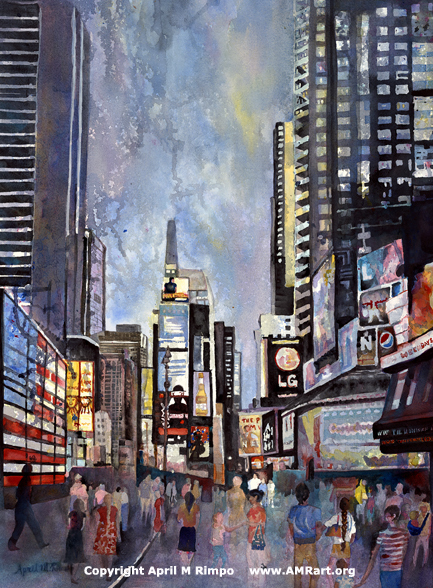 Opening on April 17th is a new exhibit at the Columbia Art Center Galleries dedicated to honor those persons who have served as inspiration in the artists' lives. The theme is to include tributes to people who have dealt with various life and health challenges in a heroic manner, or may celebrate people who have served as positive role models. A portion of all sales will benefit the Claudia Mayer/Tina Broccolino Cancer Resource Center at Howard County General Hospital. Pie Anyone? is my entry in this exhibit.I chuckle a little bit each time I look at my painting of my mother inspired by a family photograph of her in her late teens or early twenties. 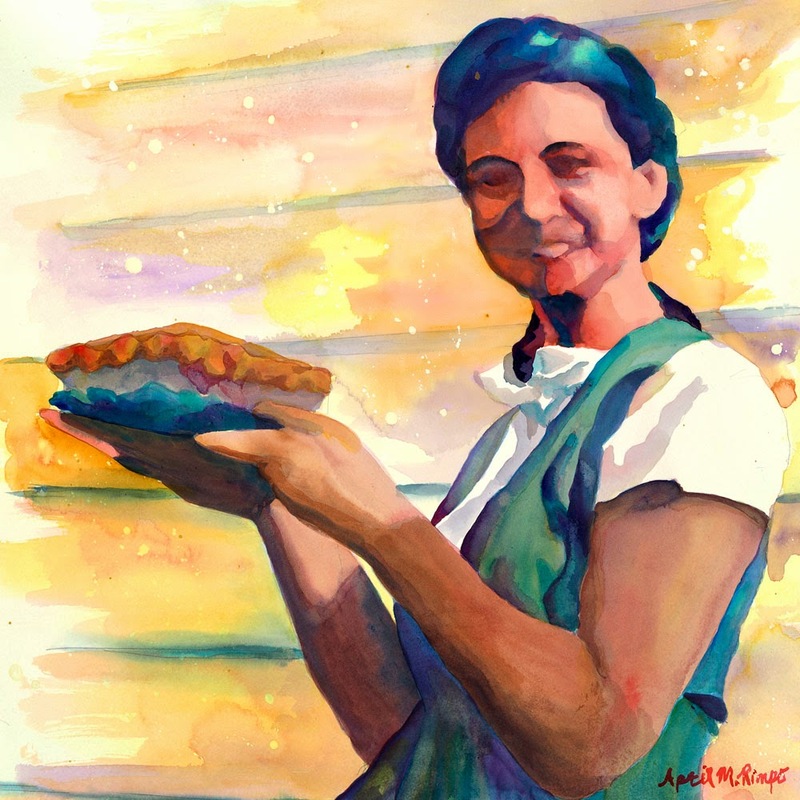 The chuckle is because when my mother first saw this painting she laughed and said, "That must have been a pie my mother baked, because I don't think I've ever baked a pie." My mother was very non-traditional in many ways. She attended college, graduating in 1946 with a mathematics and physics degree, a brilliant woman who could have done anything with her life if she had grown up in a different era. She married and moved to New England with my father, where she was turned down for jobs in her field. She ended up working in the accounting department for Mass Mutual Insurance and later did the bookkeeping for a business my father started. She always encouraged me to do whatever I wanted; I listened and received a Bachelor of Science in Electrical Engineering and worked in that field for 32 years before retiring to pursue my art full time. My mother always took adversity in stride. I read once that people who grew up during the depression often have the strength to take whatever is thrown at them and move on; that describes my mother. She would have liked to have pursued a career using her education, but accepted the times weren't right and focused on family instead. When she got ill with breast cancer in her early 80's, she had surgery, snapped right back, and return to work as soon as the doctor allowed. Yes my mother was working in her 80s. When she learned at 89 she had advanced cancer of the pancreas and that there was nothing they could do, she accepted her prognosis so naturally we wondered if she understood. She did of course, but chose to leave this life as she had lived it, calmly and with style. Since this painting is so meaningful for me, it will not be for sale during the exhibition. However, I wanted to support the Cancer Resource Center so I ask for permission to sell prints of Pie Anyone? at the Columbia Art Center during the exhibition. The prints are 10" X 10" on a gallery wrapped canvas. 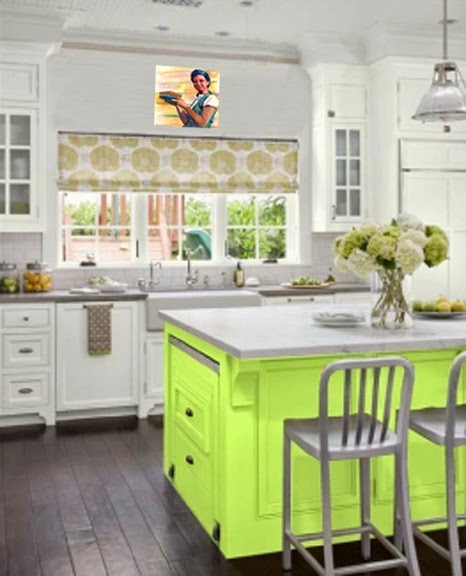 I think this print would look great in a kitchen. Because the photograph was taken in the era as the Rosy the Riveter posters, I decided to use a similar color scheme.